Me and my friend wouldn’t have jobs (we’re 16) if it weren’t for DroidScript, we’re now creating successful apps for Google Play and I’ve decided on making a full time career with programming and I wouldn’t have decided on this without DroidScript introducing me to this! The browser-based interface is genius. I imported a few HTML apps I was already using from the browser and they worked flawlessly. This is a must-have for anyone interested in developing simple Android apps. Really love your app. Breaks down complex examples into bite size lines for easy understanding! Really good! Code using the most popular programming language on the planet! 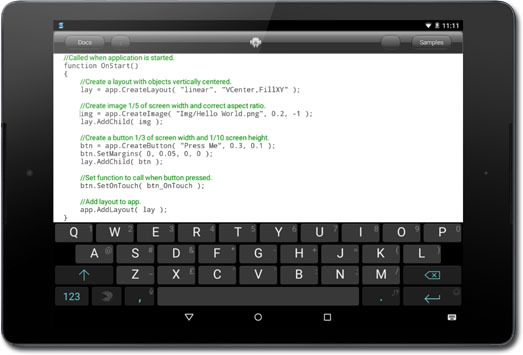 Write Apps directly on your phone or tablet. Write Apps anywhere, even on the bus to school or the train to work! Very simple to use, just install the app and start coding! 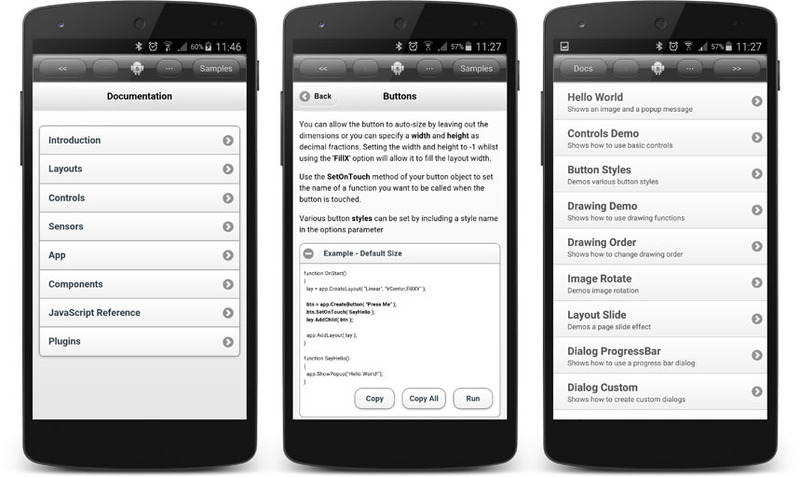 DroidScript is an easy to use, portable coding tool which ‘lowers the bar’ to serious mobile app development. It dramatically improves productivity by speeding up development by as much as 10x compared with using the standard development tools. It enables non-professional and novice coders to harness the amazing powers of modern mobile devices at home, at school or at work. You can literally code anywhere with DroidScript as it's not cloud based and doesn't require an internet connection. Unlike other development tools which take hours to install and eat up gigabytes of disk space, you can install DroidScript start using it within 30 seconds! If you prefer to use a keyboard and mouse, the WiFi IDE (Integrated Development Environment) can be used from any Web Browser, so you can develop your DroidScript apps on a Windows, Mac or Linux PC. You can remotely control, edit and debug your apps and connect to multiple Android devices at once. Simply start DroidScript on your phone or tablet and then press the connect button to start coding over your WiFi network. Build your apps for release on Google Play using our APK Builder plugin, create apps to read bar codes and QR codes, use OCR, Bluetooth beacons and much more! Use our plugin SDK to create your own private and open source plugins or extend the WiFi IDE by creating DroidScript Extensions. 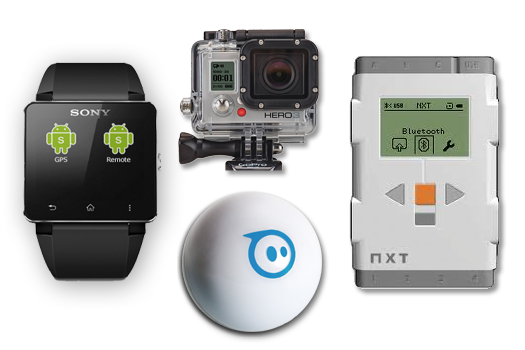 Create a Sony SmartWatch 2 App, control your LEGO NXT robot or make your own console games for Android based TV boxes. 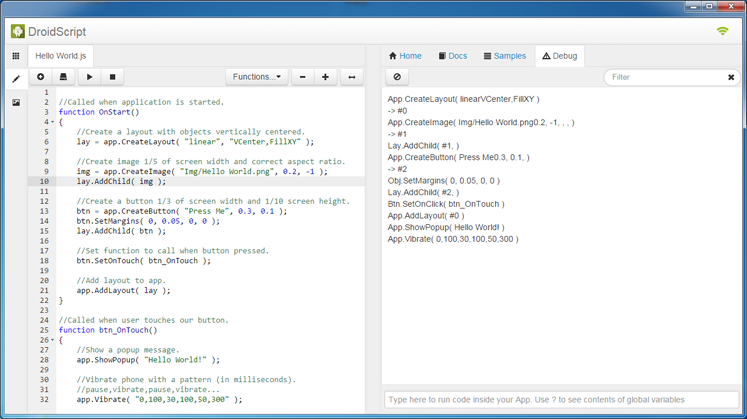 If you love your gadgets, then start writing Apps for them today with DroidScript! 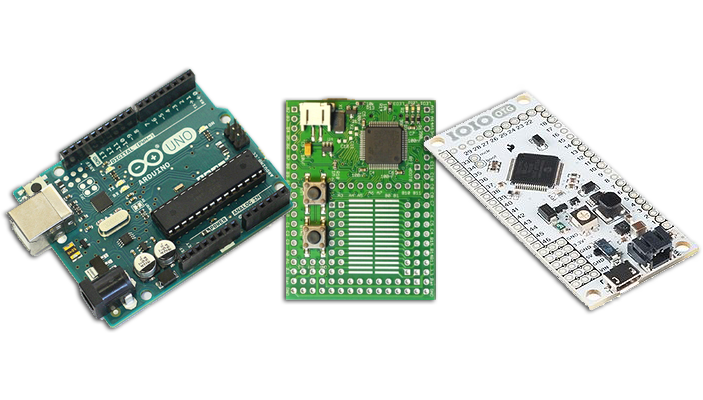 DroidScript is perfect for digital electronics hobbyists as it enables you to interface with Arduino, Espruino and IOIO boards using Bluetooth, WiFi and USB. Connect to USB Serial converters with OTG cables and write apps to control your Raspberry Pi from your phone or tablet using Ajax or Web Sockets. Check our Voice Controlled Rover to see what you can do! DroidScript is free to download, and we want to keep it that way. You can help support the ongoing development of DroidScript by buying our plugins or making a donation, thank you! Do you need new functionality for your company project? and need it fast? Well, sponsor a plugin and we will build it for you. DroidScript has an active and helpful community of users, so if you need some help, or you want to help others, come and join the community!